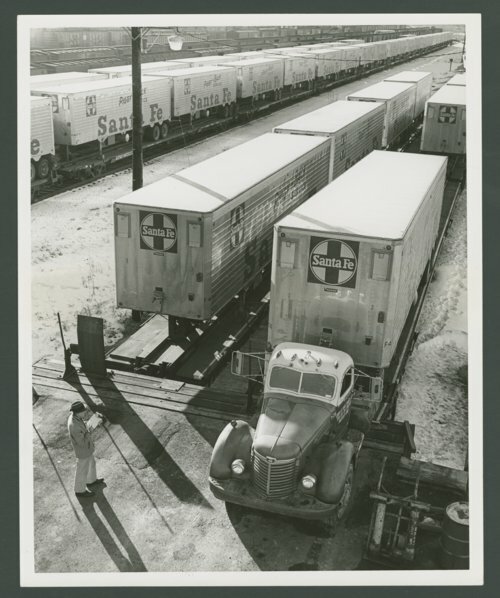 This photograph shows a trailer from the Atchison, Topeka & Santa Fe Railway Company being loaded on to a flat car. This method of loading is referred to as "circus loading". A term used to describe an older method of moving trailers on to flatcars, (TOFC), whereby a truck backs the trailer up to a ramp placed at one end of a cut of cars. The loading process requires bridge plates to be at each end of all the cars to enable the trailer and tractor to pass from car to car.